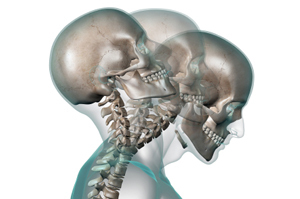 Whiplash injuries are most commonly caused by impact trauma and are often seen as a result of car accidents. Whiplash is caused by the body being carried forward causing the head to flip back – then, as the body stops, the head is thrown forwards. There is often a delay before you feel any pain or stiffness from whiplash. Many different tissues are injured in this situation, giving symptoms in several areas of the body. Symptoms you may experience include: pain and aching of the neck and back, referred pain to the shoulders, sensory disturbance (such as pins and needles) to the arms & legs and headaches. Although whiplash can badly damage your neck, for most people these injuries improve within a few weeks or months. Whiplash is a common injury presenting in our physiotherapy clinics. Our physiotherapists can help aid recovery by advising you on appropriate exercises, performing manual techniques, massaging soft tissues, correcting your posture and assisting in pain relief. Contact us at our Doncaster, Dinnington or Chesterfield clinics to arrange an appointment today.